For the 2019 season, the online Club System will only cover our Perisher lodge. Buller and Thredbo lodges will continue to be booked offline. For other Club Administration business such as Accommodation availability or Bookings, Membership Status Enquiries or offline payment of accounts for Membership or Accommodation, members should contact the Canberra office on (02) 6295 6634 as the Webmaster does not have access to club Admin records. 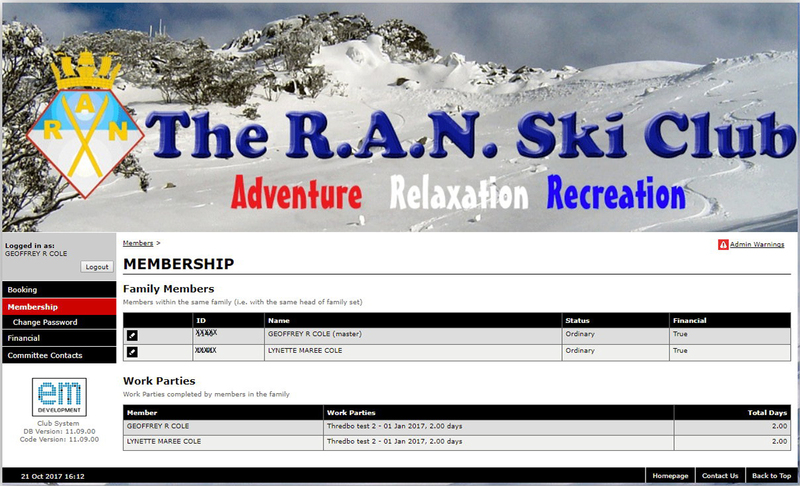 Club System is now linked to our Website (see link above) and we plan to use it, at member’s option, for accommodation bookings at Perisher for the 2019 season. Traditional mail bookings will still be available for all lodges, but for Perisher, the new system will give immediate feedback on availability and after payment, will confirm bookings in most cases where accommodation is available. If all goes well, we’ll expand use to include Annual Subs and online bookings for all lodges for 2020. Members are now able to manage their membership details using Club System. Temporary passwords were distributed on 31 Dec 18 by email to the latest email address we have for you. If you did not get one, it probably means we do not have an up to date address in Club System, as the initial data load was of the information held in our previous system. Your email address will be your login. On the first login, you will need to change the password to one of your own choice, as the system will not allow you to proceed until this is done, for obvious security reasons. Once you’ve logged in, you can check and update your membership (and family) status. Click on the pencil symbol to update your details. To summarise, the process is as follows. Members will not be able to proceed elsewhere in the site until 2 & 3 are completed. Members will also be able to manage their membership details using Club System.